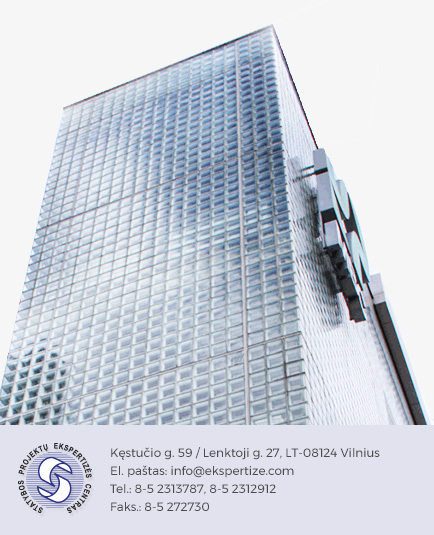 Statybos Projektų Ekspertizės Centras (Center of Expertise for Construction Projects, SPEC) has been successfully developing its activities since 1999 and has become a leading company in the field of construction project expertise in Lithuania. SPEC’s experts have acquired all the possible certificates of expertise that are issued by the Ministry of the Environment. SPEC implemented the ISO 9001:2008 Quality Management System in 2010, and the company’s activities are covered by insurance. Since 2000, SPEC has accumulated the experience of more than 9000 construction projects. SPEC’s experts are qualified to carry out all activities regarding the expertise of construction projects, including determining the technical condition of a building and the causes of accidents. They can evaluate the quality of construction work, perform laboratory tests and calculations, provide estimates, create construction projects and offer advice on fire safety issues. As the Lithuanian economy continues to grow, SPEC’s portfolio is becoming more and more solid, covering a wide range of national economic and social infrastructure sectors such as urban energy, power lines, wind farms, air and sea ports, logistics and shopping centers, plants and offices, roads and streets. SPEC is now closely interested in the Visaginas Nuclear Plant project and has taken all necessary steps to be able to participate in it as a potential subcontractor. SPEC has already been registered in the Hitachi Supplier Database, and the company’s experts have taken new examinations concerning professional and legal assessments of knowledge which include the construction of nuclear energy structures. Its expected participation in the construction of the Visaginas Nuclear Plant will not be the first SPEC project in the field of nuclear energy. In 2009, SPEC developed the fire safety concept for the Ignalina Nuclear Plant turbine hall and took part in a tender in 2012 for the fire safety plan of the Bohunice Nuclear Plant (Slovakia); both plants are being decommissioned.